Happy Sunday everyone! Here's a quick little freebie that I'm using this week. Be sure to check in on instagram (@practicallyspeeching) to see how I'm using this in my speech room! This packet should keep your word wall busy until June! It comes with 8 vocabulary words and 8 idioms. 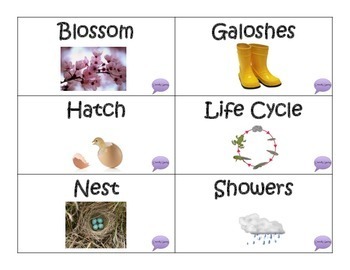 The vocabulary words and idioms all have pictures sourced from google images to go along with them. There are also 8 vocabulary cards without photos in case you'd like to use context clues instead of photo clues. Oh, and the best part? It's FREE! You can download this freebie HERE on TpT!